Hillside villages, whitewashed monasteries and quiet pebble beaches all feature on the 220km-long Corfu Trail. Follow meandering footpaths over the length of the island from Kavos in the south to Agios Spyridon in the north. Arrive Corfu Town (Kerkyra) and check-in to hotel. Corfu town is one of Greece's most elegant island capitals. The 'Old Quarter' lies above the port, its narrow streets containing beautiful houses and buildings. On either side of this are two forts: Paleo Frourio (Venetian) and Neo Frourio (Venetian). This morning we drive south out of Corfu Town, starting our hike from just south of Kavos, we head out on a track to the southern tip of Corfu, where the ruined monastery of Arkoudillas stands. A footpath leads down to the island's southernmost beach, a seemingly endless stretch of golden sand. Leaving the beach at its northern end, we follow uphill tracks through agricultural land to Spartera and to our accommodation in Asprokavos. Today's 12 kilometre walk is expected to take around three-and-half hours with 250 metres of ascent and descent. On this walk, you cross the southern part of the island to the east and back to the western coast. From Asprokavos you follow a track around a pretty and peaceful small lake where you might see birds and turtles. Afterwards you will descend through olive groves and fields to Lefkimmi. Here, your path takes you through the various neighbourhoods and historic city centre of Lefkimmi. Leaving the second biggest town of the island, you will descend into the green valley of the Gardeno River. The last part of today's walk leads you up again, so you have wonderful views of both the east and west coast of the island, before you descend to Santa Barbara. Today's 23 kilometre walk is expected to take around seven hours with 350 metres of ascent and descent. A day of almost level walking during which we follow the beach. Our way leads on through sand dunes covered with a forest of cedar trees. Then, crossing a footbridge, we reach Lake Korission. The Trail then follows tracks and a section of road to reach Paramonas and our next overnight stop. Today's 20 kilometre walk is expected to take around six hours with 150 metres of ascent and 120 metres of descent. A sharp climb early in the walk takes us over the coastal ridge, with great views, and inland to the villages of Ano and Kato Pavliana. Footpaths and tracks take us down through Vouniatades, then we cross the Messongi River Valley by way of tracks through olive groves and across heathland. Through Strongili, the Trail heads uphill again, on an old cobbled way which leads to Komianata, from here we continue on foot to Stavros. After a short break we will transfer to Pelekas where we will stay for the next two nights. Today's 17 kilometre walk is expected to take around six hours with 700 metres of ascent and 500 metres of descent. From Pelekas we take a bus back to Stavros, and our walk continues with a delightful footpath skirting Agii Deka Mountain, before we make a very sharp ascent to the summit of Agii Deka, Corfu's second highest peak. Here, an abandoned monastery in a walled garden makes an ideal rest stop. Our way continues down a cobbled mule path to Agii Deka village then along minor roads and tracks to Sinarades, where you might like to visit the Folk Museum (depending on opening times) and admire the picturesque architecture of this large village. Then the Trail leads along undulating tracks with very fine views over the west coast and inland to Pelekas. Later this afternoon you may like to take a walk up to another fine viewpoint at 'Kaiser's Throne' a favourite viewpoint of Kaiser Wilhelm II to watch the sunset. Today's 17 kilometre walk is expected to take around six-and-half hours with 650 metres of ascent. Half an hour's downhill walk takes us to Myrtiotissa, 'the so-called' loveliest beach in the world' (now used by nudists) and one of the Durrell family's favourites. Climbing now, we have to regain the height we have lost (and more), with a steep ascent on a gravel and concrete track. The west coast views are simply spectacular. Passing the village of Vatos, the terrain levels out and our way follows the bank of the Ropa River (with possible terrapin sightings), bordered by pastures and willow trees. Leaving the river, the Trail ascends into olive-blanketed hills, where tracks lead to Liapades, an ancient village full of lovely old mansion houses. We stay in nearby Liapades beach, surrounded by green hillsides with a beautiful pebble beach and some small cafes and restaurants. Today's 23 kilometre walk is expected to take around seven hours with 600 metres of ascent and 800 metres of descent. Today is left free to explore. Situated below the traditional village of Liapades, and surrounded by green hillsides Liapades Beach has a sand and single beach and some small cafes and restaurants. You may also like to join an optional boat trip up the west coast of Corfu from Paleokastritsa to Ermones beach (boat sailing is dependent on weatherea conditions). You can also wander around the famous Paleokastritsa Monastery situated on an spectacular promontory, a 2 hour walk or short water-taxi ride away (own cost). First thing this morning we negotiate a steep and fairly difficult ascent up to Lakones and Bella Vista (the best view in Europe). After a kilometre of unavoidable road we take a break for lunch. In the afternoon our walk continues across olive groves to Krini, through Lily Valley and on down one of Greece's most remarkable footpaths, which zigzags down a sheer cliff. Our accommodation tonight is in the pleasant beach resort of Agios Georgios, where it may be possible to hire wind surfers. The wide empty beach north of the resort was used for scenes in the James Bond film 'For your eyes only'. Today's 13.5 kilometre walk is expected to take around four hours with 3oo metres of ascent and 500 metres of descent. A sharp climb from Agios Georgios to the village of Prinilas starts today's walk. We descend from here to the picturesque village of Pagi. Tracks and a quiet road take us through agricultural land alongside the Megapotamos River and over the ridge through Aspiotades, to the two sprawling villages of Agros and Agios Athanasios, where our way leads through the alleyways. Leaving the villages, a quiet road leads past the wealthy convent of Agios Athanasios and tracks take us on to the road junction at Rekini. From here we plan to take a bus for the short journey to the nearest accommodation on the north coast at Roda. Today's 14 kilometre walk is expected to take around four-and-half hours with 450 metres of ascent and descent. A local bus takes us back to the Corfu Trail. Starting our walk from Rekini, we take the unmade road to Valanio, a village deep in the middle of nowhere. Then tracks funnel us up a deep valley. Along a cobbled path, we enter Sokraki, where the village square with its happy atmosphere calls for a stop. Then to Spartillas, where a chartered bus is waiting to take us down to our accommodation at the picturesque coastal village of Kalami. Here, in the White House, Lawrence Durrell wrote Prospero's Cell. The little bay in Kalami is lined with white pebbles and has a panoramic backdrop of mountainous Albania. Today's 14 kilometre walk is expected to take around four-and-half hours with 550 metres of ascent, we are transferred to Kalami from the top of the village. Today the real mountain terrain beckons. We transfer by bus back to Spartillas and start our walk: immediately we are on a steep mountain footpath climbing a gully to a fantastic viewpoint at Taxiarchis Chapel - a ruin with fresco-covered walls. We ascend further to cross the Karst Plateau, Corfu's wildest scenery, under the summit of Pantokrator. Then we make our way to the very top, at 917m, and visit the monastery, with its views across to the mountains of Albania. Descending now with fine views and some rough sections we reach the deserted village of Polie Perithia where we stop at a tavena before we descend the final stretch of the Corfu trail ending at the most northerly point of the island. Todays 21 kilometre walk is expected to take around eight-and-half hours with 500 metres of ascent and 850 metres of descent. The optional climb of an additional three kilometre to the summit will take approximately one hour with an additional ascent and descent of 250 metres. Today you may choose to relax in your free time or alternatively you could walk the five hour, 15.5 kilometre round trip from Kalami to Mengoulas. time exploring more of Corfu Town: there is certainly plenty to keep you occupied. The town has some sophisticated restaurants to round off your tour in style. Our trip ends this morning in Corfu Town (Kerkyra). Greece has predominantly hot, dry summers, May - October with tempertaures reaching into the mid thirties in July and August. May and October themselves can be less predictable and may have some rain and cooler evenings. Wild flowers bloom in April and May adding much colour to the trails. At the beginning and end of the season the villages tend to be very quiet. Seasonal weather patterns can be unpredictable. Up to date information on the weather worldwide can be found by following the BBC weather link on this page. Corfu Town - Allow approx. €15 for misc. entrance fees; Kanoni Peninsula €3.50. Liapades Beach - Boat trip up west coast (depending on numbers booked, the minimum required for the trip to operate being 6) €15. Agios georgios Wind surfer hire €10-12per hour. Bring light and comfortable clothing that can be layered according to the temperature. The weather conditions in the mountains can be changeable, and it can become cool, especially at night, so bring warmer layers. Tops made from wicking materials which keep you drier and warmer are recommended as a base layer, and walking trousers are preferable to trousers of heavier material such as jeans. A waterproof jacket is essential at all times in case of rain and wind. Bring one main piece of luggage and a 20-30 litre day sack is recommended. You will need to carry what you need for the day which may include a raincoat, jumper, camera, sun-cream, water and picnic lunch. On hot days you will carry fewer clothes but more drinking water. You will be carrying only your day bag during the walks and main luggage shall be transported from hotel to hotel by car. GBP Sterling or US Dollars, cash. Cash can be drawn from ATMs from all types of cards in most areas in Greece, including the islands. Banking hours may make exchanging Travellers Cheques more difficult. Throughout this trip we use a mixture of simple and standard accommodation. Due to the small size of the properties in Liapades and Kalami, the group may be spread over a variety of studios/apartments in the area if necessary. In Lipades we'll use the AVRA Sunset Sea View Liapades as a communal base with use of all the facilities there including the hotel's swimming pool. This is where breakfast and dinner will take place. As with the nature of apartments in this part of the Mediterranean the size and standard of the rooms can vary, the rooms will be decorated in a plain style with private bathrooms and some may have a balcony or terrace. Greece: Visas are not required by UK, Australian, New Zealand, US and Canadian citizens. Other nationalities should consult their local embassy or consular office. Nothing compulsory but we recommend protection against tetanus and polio. Please check the latest requirements with your travel clinic or doctor prior to departure. The above is not an exhaustive list. Further information regarding vaccinations and travel health advice can be found by following the NHS and NaTHNaC links at Explore Travel Health and from your local healthcare provider. Visa and vaccination requirements are subject to change and should be confirmed by you before travelling. This hike covers 220kms with between 5 and 7 hours of walking most days. This trek has been graded as moderate to challenging. 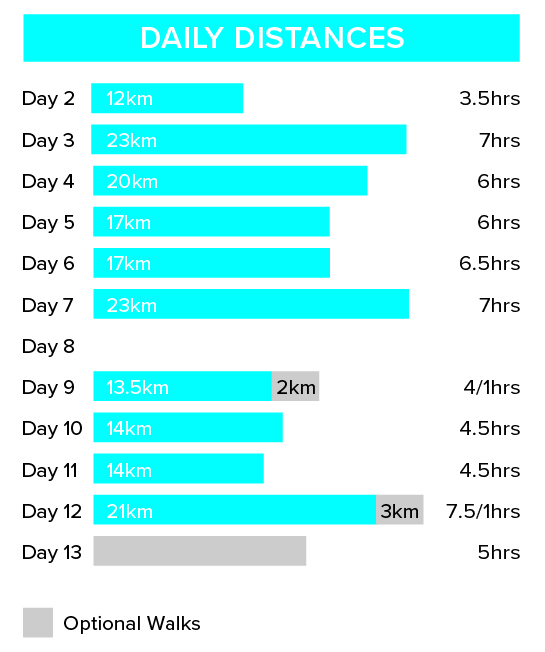 Walk on 10 days for 4 to 8.5 hours, and up to 9 hours on day 5. 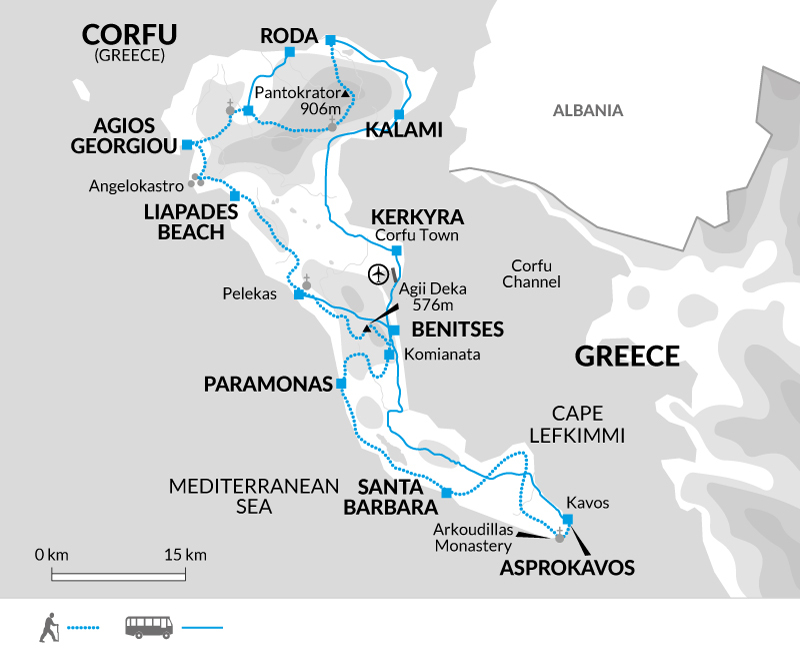 Walk along dedicated coastal and mountain paths, minor roads, old mule tracks and beaches. The highest point reached is 917m. whilst the longest days are a more strenuous 8-9 hours (though this is the last day of walking) when we are based in Kalami. If you don't feel up to any day's walk, you can always take a taxi to the next nightstop.